Designing effective policy to influence household retirement-saving behavior requires a deeper understanding of household motivations for saving and retention of wealth, particularly at older ages. In their 2015 working paper, “Comparing Retirement Wealth Trajectories on Both Sides of the Pond,” Richard Blundell, Rowena Crawford, Eric French, and Gemma Tetlow (BCFT) look at the course of household wealth between the United States and England in order to assess how the differences in institutions and asset returns between the two economies are affecting incentives for household saving behavior post-retirement. BCFT draw their U.S. data from the Health and Retirement Study (HRS) and comparable data from the English Longitudinal Study of Ageing (ELSA), limiting their analysis to households age 70 or older. The ELSA was designed to allow for direct comparison with the HRS, resulting in few methodological differences in the two surveys. 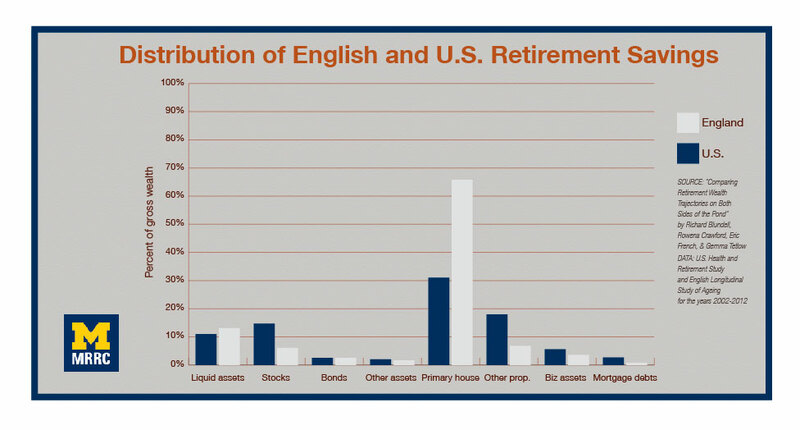 While wealth distribution is similar for U.S. and English households at retirement, there are significant differences in the composition of this wealth. More than 20 percent of U.S. households report housing debt, with only 5 percent in the England reporting the same. Income trajectories appear to deviate between the Americans and the English in later life, with real incomes falling with age in the U.S. and rising with age in the England. Asset wealth declines with age in the U.S., while it rises in England. The increase in English asset wealth is driven primarily by increases in housing prices during 2002-2005, which outstrip housing price increases in the U.S over the same time period. However, nonhousing wealth in the U.S. also declines more sharply than in England during this time period. Overall, it appears that households in the English draw down their wealth more slowly than in the U.S., despite having higher income trajectories. BCFT explore the various motivations that can explain the differential rate of wealth drawn down between the two countries. They find that more than 70 percent of older households in England report that it is ”very important” or ”fairly important” to leave an inheritance to heirs, with the comparable number for the U.S. being 50 percent. Bequest motivation may be part of the explanation for English households retaining more wealth into older age, but it doesn’t appear to be the only explanation. Another reason for households to retain wealth in old age is the precautionary savings motive to account for unanticipated medical care costs. However, given that the National Health Service (NHS) funds health care in England, this should create incentives for English households to drawn down wealth faster because they do not pay out of pocket for health care. However, as BCFT illustrate, since the NHS does not cover nursing home costs, which dominate medical costs at older ages, the true difference in medical care costs between the U.S. and England is possibly smaller than naive estimates would suggest. BCFT do find high quality data on late-life medical care in the England lacking, and cannot make a conclusive claim regarding precautionary health savings differences between the U.S. and England. BCFT also discuss the possible motivations that can govern the lack of drawn down of housing wealth in later life. They argue that housing wealth is illiquid and its sale requires large transaction costs, which may serve as deterrents to selling and renting. In addition, older households may draw utility from home ownership itself, resulting in a low propensity to decumulate housing wealth. They find that these theories are supported by the data, but they apply equally to older households in England and U.S. and, therefore, fail to account for the difference in housing wealth trajectories between the countries. They find that mobility is significantly lower in England relative to the U.S. The English housing market is also characterized by short-term mortgages, accompanied by age limits to which these mortgages can run, as opposed to the U.S. where age discrimination is forbidden by law in the housing market and mortgages are longer term. Because of these features, moving households in England can contribute to larger psychic and financial costs than in the U.S. This also may explain why English households are not drawing down housing wealth as fast at U.S. households. BCFT conclude that their analysis provides enough suggestive evidence for the impacts of bequest motives, precautionary savings for health care, and housing on wealth trajectories in older ages that future modeling of households’ life-cycle saving decisions m consider incorporating these motivations.